The Everton goalkeeper, 25, is starting tonight between the sticks in Podgorica for the Euro 2020 qualifying match against Montenegro. He’s cemented his position as number one in goal since his decent showing at the World Cup last summer. He will win his 17th cap today for the Three Lions. 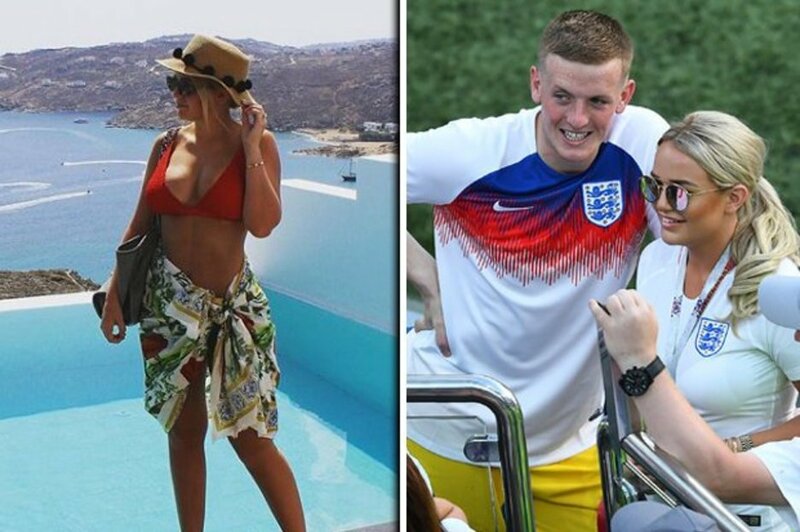 And Pickford can count on his wife-to-be and child’s support from home. Megan Davison, who is engaged to be married to Pickford, shared a selfie with her 50,000 Instagram followers. She holds her little child in her arms from inside the kid’s room. Fans flocked to the comment section to gush about the family snap. The couple announced the birth of their first child last month, with both sharing photos on Instagram. They haven’t yet shared the gender or name of the little one. Megan is a graduate from the University of Sunderland, where she left with a 2:1. She and Pickford are childhood sweethearts, meeting in school when they were 14. Although both from Sunderland, they moved together to Liverpool after Pickford joined Everton in 2017. Clearly embracing the glamorous lifestyle, she regularly posts pictures in amazing outfits and from romantic holidays. England and Montenegro fans were mingling without incident in the streets and bars adjacent to the Gradski Stadion ahead of the Euro 2020 qualifier tonight. The Three Lions are looking to build on their 5-0 win over the Czech Republic on Friday night. Hostility is expected inside the compact 15,000-seater ground during the 90 minutes. England are looking for their first victory in Montenegro after drawing their previous two matches here. Gareth Southgate has spoken to his players about keeping their cool in such an atmosphere and the visiting supporters were enjoying the experience as kick-off neared. There was a heavy police presence but appeared to be no immediate threat of any of the joviality spilling over into pre-match trouble.